Vein Guard is a multi-homeopathic therapy to ease tired, aching legs and feet, varicose and spider veins, swollen legs and ankles. Here’s a revolutionary, new natural remedy that miraculously improves bulging, bluish, lumpy-looking varicose and spider veins; relieves tired, aching legs and feet; and swelling and itching of your legs. It begins to work immediately – from both the inside and the outside – for fast, noticeable results! Supported by the latest scientific research, Ultra Vein-Gard helps guard against these leg problems by getting to the underlying cause of the condition before it starts. It’s available in both a luxurious leg therapy cream for topical use, and preservative-free capsules that work from the inside out. 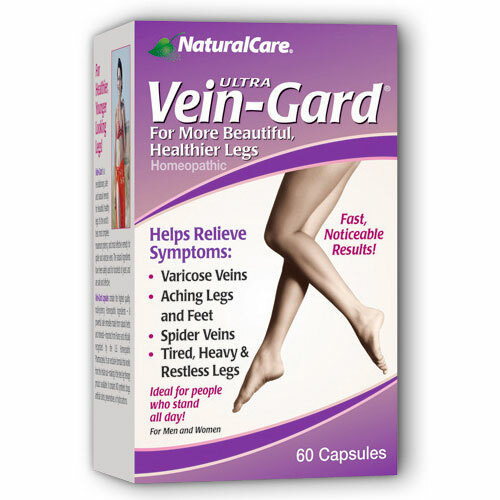 Vein-Gard is the most complete, highest potency, and most effective varicose remedy available, and there are no synthetic drugs or side effects. Ultra VeinGard a multiple-potency homeopathic for the safe, natural relief of painful swelling & discomfort of bulging varicose, spider veins, heavy, tired, aching feeling in legs, swollen feet and legs. Ingredients: Active Ingredients: Horse Chestnut (Aesculus hippocastanum) 3X, 6X, 3c, Witch Hazel, (Hamamelis virginica), 1x, 4x, 3c, Honeybee (Apis mellifica) 3x, 6x, 12x, 30x, Wind Flower (Pulsatilla), 3x, 6x, 30x, St. Mary’s Thistle (Carduus marianus) 3x, 6x, Club Moss (Lycopodium clavatum), 6x, 30x, Ergot (Secale cornutum) 3x. Other ingredients: bromelain (1500 mcu), Vitamin C, Rutin, Horse chestnut seed extract at 20% escin, Butcher’s Broom at 9-11% ruscogenin, ginger, cayenne, lecithin, gotu kola extract at 8-10% triterpenoids, quercetin, grape seed extract at 95% proanthocyanidins. Suggested Use: Adults take 1 Vein-Guard capsule, 3 times daily with meals. For optimum benefits, take 2 capsules 3 times daily. Warnings: If you are pregnant or nursing a baby, seek the advice of a health professional before using this product. Keep out of the reach of children. This entry was posted on Thursday, July 12th, 2007 at 12:00 am and is filed under Skin Care. You can follow any responses to this entry through the RSS 2.0 feed. You can leave a response, or trackback from your own site.